Last month I shared my bedroom plans with you however since then a few things have changed and I've decided to completely move my bedroom around to allow for more storage space. My room is a long rectangle shape which is quite annoying as it limits me to where I can put furniture. I've had a hard time deciding on a bed and the one I really want with this gorgeous headboard is out of stock for 12 weeks so I think I'll have to settle for the other one instead. I have been looking for cheap beds as I'll be spending quite a lot on the furniture. Speaking of beds, as I currently have a king size bed all of my bedding is king size as well as the duvet so I'll be buying a new duvet and bedding too and then keeping the king size as spares. I think I might treat myself to a luxury feather duvet and some new pillows as mine are a good few years old so that should definitely help getting a good nights sleep. I've decided to get rid of my bedside tables and put the new bed in one corner instead and just have one bedside table. This should give me more space down the other side of the room for furniture. I have been looking at bedside tables and as much as I love the ones I currently have they have been damaged and are too big to go in the space I will have for them. I'm looking at either this Hemnes one or a using a Malm 2 drawer cabinet which are both small enough. I am getting rid of my double wardrobe with sliding doors as the doors no longer slide and are hanging off which is dangerous with the kids around. It took me a while, a couple of weeks in fact to finally decide on new ones. As much as I would love a walk in wardrobe or a proper built in wardrobe with sliding doors I don't have the room so I decided to buy two of these wardrobes instead as I should hopefully be able to build them myself and they'll be easy to move if needed. I do have a desk in my bedroom already but I have been looking at buying a dressing table. I just can't decide on which one to buy as it depends on how much space I have left after everything else so I'm going to wait until my Ikea delivery arrives on Friday and then I can decided which one to buy. It's between this one and this slightly bigger one. I'm thinking if I buy the bigger one I could put my iMac on there and use the rest of the space as a dressing table and get rid of my desk or perhaps move my blogging space downstairs instead. I've needed a big clear out for a while now so I thought now was the perfect time to de-clutter. I recently bought some under-bed storage boxes to hide away any clutter and clothes which aren't currently being worn. I'm hoping to have it all finished in a couple of weeks or by the end of next month at the very latest so I will share the overall look on here and give you a little tour. Do you have any plans for decorating this year? I would definitely go for the Malm dressing table. 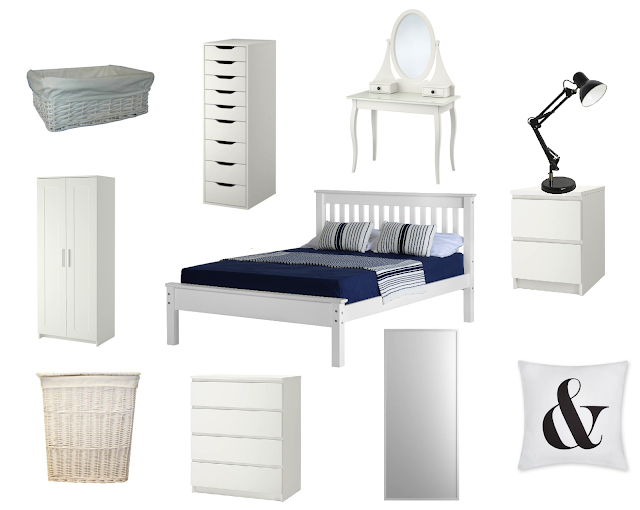 I had the Hemnes dressing table but I ended up getting rid of it. It takes up so much space because it's so tall. Also the mirror is too far away to actually do your make up in, so I ended up using a smaller mirror and having that on my dressing table as well. I didn't use the big mirror at all so it was pretty pointless. Love all your ideas. Wish I was closer - I'd offer to buy your bedside tables from you! We moved into our new house this past summer so the decorating has been so much fun. Enjoy your new room once it's all put together. Gorgeous ideas! I have something similar to the headboard you want. Mine is from Feather and Black's (Olivia). I love the dressing table from Ikea and very nearly bought it but I figured out I'd never sit down to put on my make up (more likely the girls would sit there and cover themselves in lipstick!) I think we have half of the Hemnes collection at home, he he! Your rooms going to look fab you'll have to do a room update post. Blake has the wardrobe and the malm dresser there so handy for all his stuff. We also have under the best storage boxes which I need to have a sort out of actually. I'll move to new house. Your idea is great to me. Thanks!